The images are dramatic, showing some of Eureka’s most important areas completely submerged in water. The Bayshore Mall, Costco, Schmidbauer Lumber, even parts of Old Town and Highway 101 would lie beneath the surface of the ocean according to the worst-case-scenario projections for sea level rise and tectonic subsidence by the year 2100 in a new draft report prepared for the City of Eureka. Inundation maps were developed by Jeff Anderson of Northern Hydrology & Engineering for the Humboldt Bay Sea Level Rise Vulnerability Assessment Project. 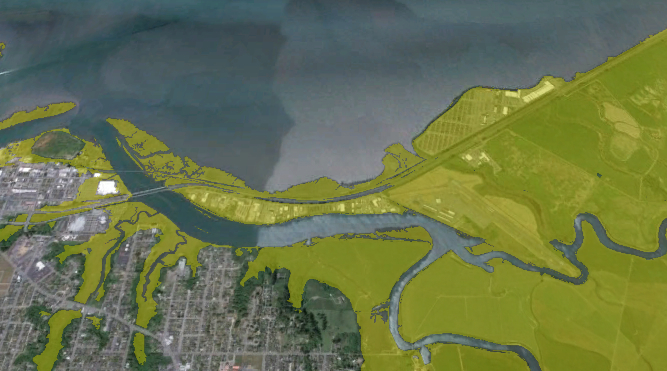 The maps show areas vulnerable to existing and future sea levels that are currently protected from inundation due to the natural shoreline, dikes or berms, and railroad or road grades. President Barack Obama issued an executive order on Friday directing federal, state and local agencies to incorporate projections for sea level rise in planning and construction along the coasts. The winter’s highest tides are predicted for this week, but without the storms that hit Humboldt County in late December, flood risk is minimal, according to the National Weather Service. National Weather Service meteorologist Matthew Kidwell said the tide, which is considered a King Tide because of the alignment of the sun and the moon, peaked at 8.4 feet Monday morning and will probably be a little higher today and Wednesday. The highest and lowest tides of 2014 known — as the “king tides” — hit California’s coast on Monday, with this year’s event getting a leg up from the recent offshore winds, according to National Weather Service meteorologist Kathleen Lewis.